Today is not just any old Sunday, it is a special day fondly refered to as a Green Bay Packer Home Game Day. 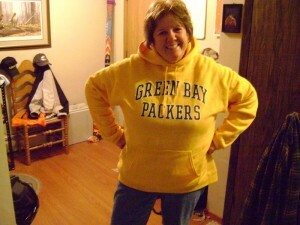 Being fairly new to following the “The Pack” , I have found the many aspects of being a “Packer Fan” truly amazing! Initially I was appalled to see on Sunday many of my fellow parishioners, children to adults, wearing their green and gold to church. But over time I have come to expect it. Our senior pastor is from Chicago and is a Chicago Bear’s fans. So if it is his day for the sermon, the Bears and the Packers find their way into the sermon or at least the announcements at the end of the service. A few weeks ago the same Pastor remarked on the early Sunday morning heavy traffic heading north on highway 41 , surely all these people couldn’t be on their way to church, then he realized, it was a Green Bay Packers Game Day. 60,000 plus fans take to the road for the event. Some even take to the air, the armed services typically salute game day with a “fly over” of the stadium during the pre game activities, very exhilarating to the senses! Last Sunday was a home game and the Packers were hosting the Miami Dolphins. On the way home from church I decided to make a quick stop at the grocery store. The game had already started and was being blasted out over the parking lot as I approached the store. Once I got inside, there were large screen TV’s suspended from the ceiling in several parts of the store, so both shoppers and workers could stay abreast of the game while they shopped or worked. Festival Foods, a local grocery store, always runs a special on game day: with each pound of hot sliced ham or turkey, shoppers get a free package of hard rolls and there is always a long line of people eager to partake of this. Trays of veggies, cheese and crackers, lots of dips and of course beer find their way to the check out counter where the cashiers are all decked out in Packer Jerseys. Game day is always a reason to eat, drink and be merry, for individuals sitting in front of their glowing TV screen alone or large groups gathered at friends’ homes in front of a choice 60′” HD TV. Businesses show their team spirit in other ways. A local used car lot in NW Appleton, always has out their huge balloon-like Packer guy, to prove their loyalty and perhaps draw people into their lot. When game day falls during the week, many workplaces encourage their people to do a little celebrating by allowing their employees to wear their Packer colors and to have a potluck tailgate spread to munch on throughout the work day. Individually people throughout neighborhoods fly their Packer flags and show off other Packer paraphernalia with pride. Throughout the day you see cars with little flags, bumper stickers, and dangly things hanging from the rear view mirrors. It is a great time to walk the dog, throughout the neighborhood, you see no one walking or working in the yard. In fact the traffic in general is scarce. For me personally, I find it a good time to get out my “Packer Girl” yellow hooded sweatshirt to keep me toasty warm during the afternoon festivities, my own little way of trying to belong to this foreign land of the cheese heads. My husband, you will find bundled up in his logan green terry cloth bathrobe, over his street clothes, with the recognizable Packer logo emblazoned over his heart,no surprise there. I suspect over time a few non clothing Packer souvenirs will find their way into our home as holidays or birthdays momentos. As for tomorrow, it is not just any home game, it is the day that Brett Favre and his fellow Vikings come to town. Favre comes on the heels of personal scandal allegations which adds fuel to the Packer Revenge mode of thinking. The media and every man on the street speculate as to the outcome of the game. Sack the QB, legally of course, is probably one of the popular strategies for a win. Most GB fans want to see the Vikings run out of Green Bay with their tails between their legs. Last year it did not happen, we will see what this game brings. For many fans, hopes are riding high that this will be the year Green Bay will make it to the Super Bowl, but already early season injuries have shaken their stance on such a triumph. They were so close last year. But the team suggests the bugs are ironed out and things are looking good for this year, just as soon as everyone is healed. Sigh! Packermania even reached the Great White Way or Broadway, with the stage play entitled “Lombardi” premiering this week. Many play goers were pleasantly surprised that the show’s focus was not purely about football, but about the devotion that Coach Lombardi had for his players that help the team and the city of Green Bay earn national acclaim. It was a special relationship, between coach and players, like no other, and worthy of analysis via the stage. So, back to game day, to Wisconsin, football is recreation, a topic of constant discussion,an economic industry and most assuredly a beloved institution. So where will I be tonight? Right in front of my TV, where most of the state of Wisconsin will be, cheering on the team to a needed division win.